Dr. Ana Lara is one of the recipients of the 2019 Oregon Literary Fellowship. Oregon Literary Fellowships are intended to help Oregon writers initiate, develop or complete literary projects in poetry, fiction, literary nonfiction, drama and young readers literature. Writers in the early stages of their career are encouraged to apply. The awards are merit-based. 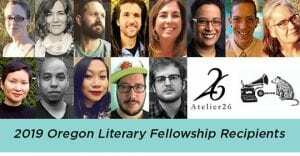 Fellowships are also awarded to support Oregon’s independent publishers and small presses. They are awarded to presses or magazines that demonstrate a commitment to literary publishing.